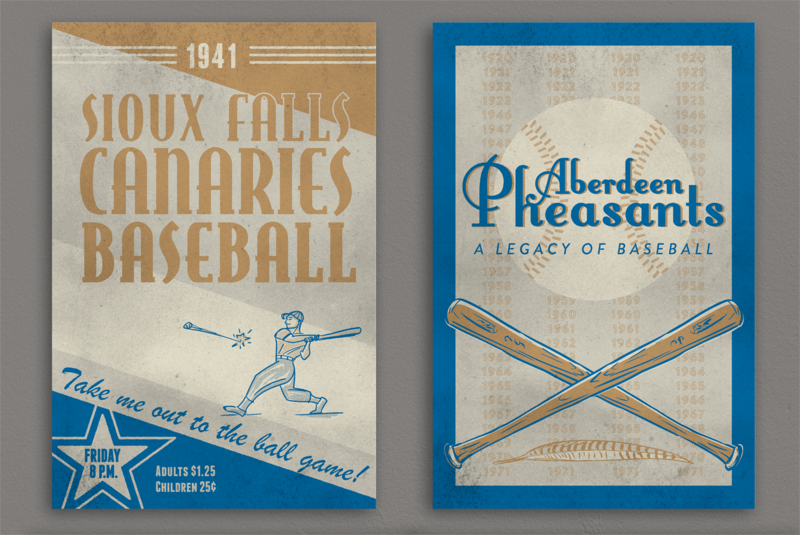 I was commissioned to create a series of posters celebrating South Dakota’s contributions to, and memorable events of, the Golden Age of Baseball. 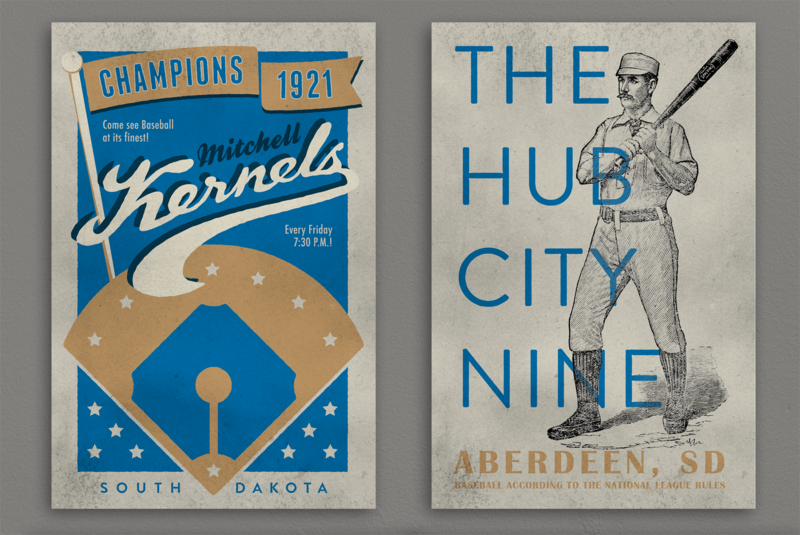 The goal was to create a unified set of posters (24 x 36″) that would invite the viewer to explore events and teams in South Dakota’s rich but often forgotten baseball history. The South Dakota League was founded in 1920 (and disbanded in 1923). The league grew from 8 initial teams to more than a dozen teams during its brief run, and the Mitchell Kernels won the championship the first three years: 1920, 1921, and 1922. 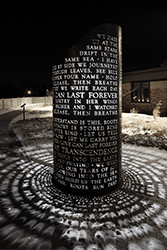 Frank L. Baum is better known for writing The Wizard of Oz than he is for his contributions to baseball, but in 1889 he founded a baseball team in Aberdeen, South Dakota. The Hub City Nine held its first practice on May 29, 1889, had a great first season, and then disbanded due to financial troubles. 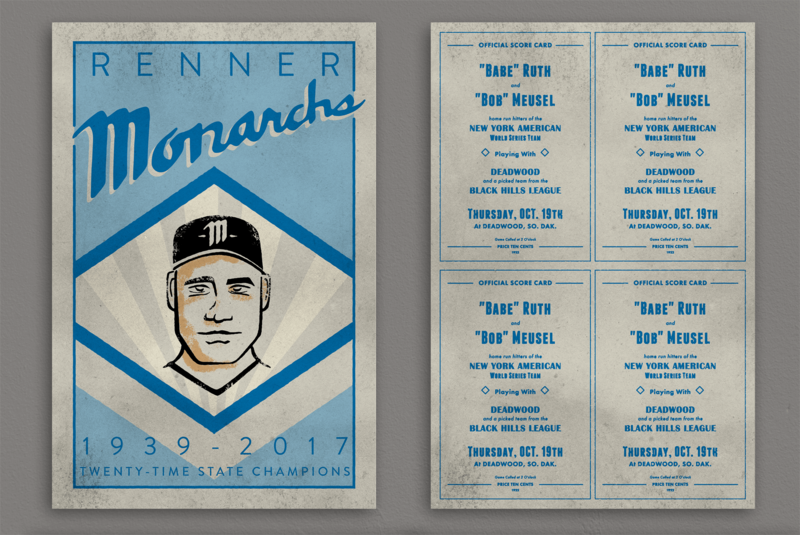 The Renner Monarchs have won the South Dakota state championship twenty times since 1939. 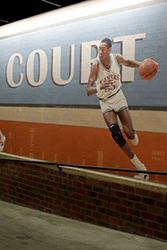 Although there was organized professional baseball in Aberdeen as early as 1889, the story of the Aberdeen Pheasants really begins in 1946 when a group of local businessmen established a relationship with the St. Louis Browns (who later became the Baltimore Orioles). The team was so strong that in 1964 they played an exhibition game against the Orioles, losing 6-3. The Aberdeen Pheasants played from 1946 until 1971 when the Northern League shut down.